BMW Motorsport Puma Crew Neck T-Shirts Lot of 2, Navy Red White Navy Size Large. Condition is Pre-owned, no stains or holes, see photos for condition and other details, feel free to ask questions. Approximate measurements Armpit to armpit:22.5" Length:28.5" Shipping only to PayPal verified addresses within 48 hours of receipt of payment . If there is a problem with your purchase and item is not as described, please contact me prior to leaving feedback and I will do my best to resolve any issue. Thank you for looking! Style/Group: M Slice No. 1 Puma Graphic Tee. Color/Pattern: "Puma Black - Puma Red" (black with red, white, and grey print). Textured graphic print, logo print on sleeve. Style Number: 85170903. Size: Large. 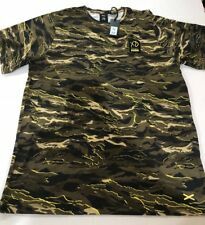 The Weeknd PUMA X XO Camouflage T Shirt Camo Military Size L. Condition is New with tags. Shipped with USPS First Class Package. Israel 2005 17th Maccabiah BRASIL Jersey. Authentic Jersey By PUMA. Length (top to bottom): 26 ". Armpit to Armpit: 22 ". Shoulder to Shoulder: 18 ". Brand New, with tags. Free standard shipping. Expedited shipping is at the cost of the buyer. Payment is due with 2 days via Paypal. No other payment forms accepted. FastPayment = Fast Shipping! Returns accepted, buyer paysshipping. Preowned Puma Volvo "Ocean Race Round the World" Short Sleeve T Shirt. Condition: Very good preowned condition. New With Tags Puma Men's PUMA/COOGI Authentic T-Shirt Black 578131-01. Condition is New with tags. Shipped with USPS First Class Package. Men's Ferrari Logo Yellow Tee shirt by Puma - MSRP $35.00.L.XL. Rise up to the occasion in the PUMA® Logo Tower Tee. PUMA® Lifestyle apparel marries the essence of sports performance with the refined finishes and detailing of the fashion industry. Crew neck. Straight hem. Crew neck - Short sleeves - Front logo graphic. Machine wash warm. Size Large. 100% cotton. 30" length. Size: Large. Back Length: 28.5”. Chest: 22". Inventory #1781. Sleeves: 19".